In recent times it seems there is no shortage of young and gifted musicians pouring out of the music education system, and with many courses now available specialising in jazz, that most intuitive of idioms it must seem daunting for the listener and well as the recently graduated ‘musician’ on how a viable living can be made whilst nurturing your art and creativity. Luckily for us, many such musician’s seem to leave their studies with a built in ‘can-do’ attitude, and it this spirit that gives momentum to a new generation that are quickly having to be more self reliant than ever in securing gigs, tours and commissions. 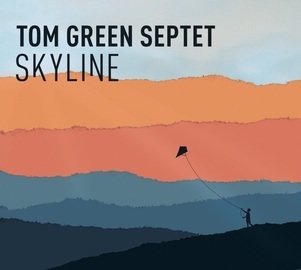 Once such musician is trombonist, Tom Green, who has recently released his debut album Skyline on the newly formed Spark! Imprint, with his superb Septet and some wonderful original compositions and arrangements. As our conversation once again returns to the release of Skyline, the subject of marketing and labels inevitably crops up, with Green choosing the path of setting up his own imprint. “When I was looking to release the CD I felt like there were no labels who would give emerging artists the care and attention they need at the start of their careers. Many labels are much more interested in their established artists as that is where the money is. Through a number of discussions with the co-founder of Spark, the great drummer and composer JJ Wheeler, who’s been a friend for quite a few years now, we realised we wanted to provide a platform to get younger musicians heard and noticed, providing them the right amount of support, and this is the major aim for the label – to showcase new and exciting music by younger artists in a way that’s sustainable for their future careers. We’re putting together a plan to release some more music in the very near future, by other musicians as well as more of our own music.